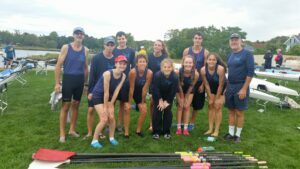 Today, Coach Pam revisited her college years competing in her first regatta since then (just a FEW years ago). Hanging around these remarkable kids is infectious, and well, I had to go do it. It was a far more emotional, and well, unusual experience than I expected. The child in me wanted to “kick …” while the coach in me wanted to exemplify poise and great rowing regardless of the outcome. Well, um, I’m not sure what to call who showed up, but I can share the result: I’m addicted…. again. And, I am even more proud of our club and the kids that make it possible (not to mention the other two kids at heart Coach Ron & Coach Ed!!!). Why do we do this? I will try to make this short… because when we row, we love it. No matter how early we get up, how many boats we carry (or boat parts), no matter if we fall in, we get back up… and in. And we row. And it is then and there that rowing becomes personal, whether you are in a single, double, quad or eight. And in that personal place, you dig deep, and you find the power and potential for you and your team. And when you are done, you look forward to doing it again, but better.